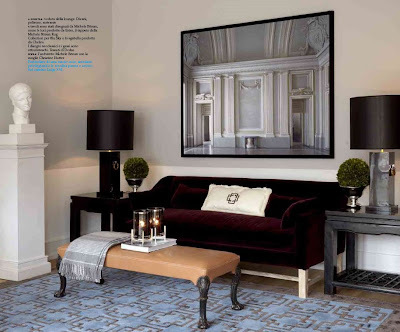 The Heidelberg Suites is ultra-chic, as is typical of Bonan’s designs. The Heidelberg Suites Boutique Hotel opened in the fall of 2008. 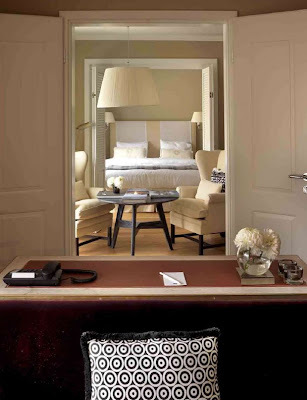 It is an extraordinary hotel property located in one of Germany’s oldest and most charming cities. It is composed of villas from the turn of the century which were restored and furnished by world-renowned architect and interior designer, Michele Bonan. 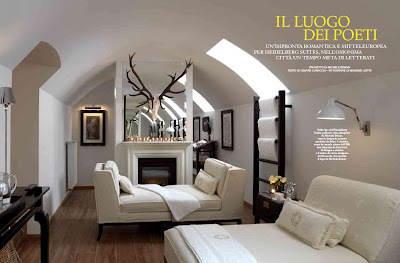 You may already know and love a couple of his projects, like the JK Place Firenze in Florence and the JK Place Capri. Sounds charming, doesn’t it? 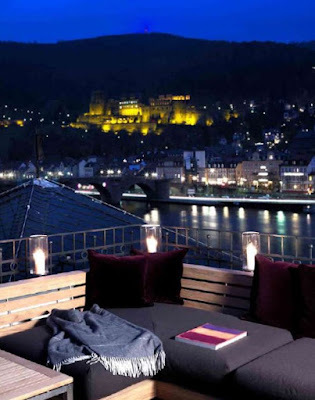 The Heidelberg Suites is situated next to the “Old Bridge” and overlooks the Neckar River. Every room in the hotel features an incredible view of the Castle as well as the “Old Town”. It is also located within walking distance from all of the historical sites. The hotel also features a rooftop terrace, garden, and spa. 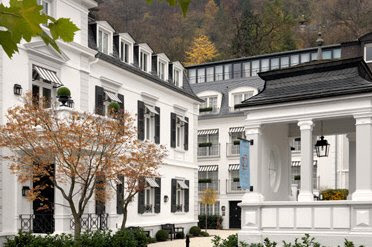 Michele Bonan was inspired by the history of Heidelberg when creating the hotel and focused on a vision of “German Romanticism meets Italian Architecture. 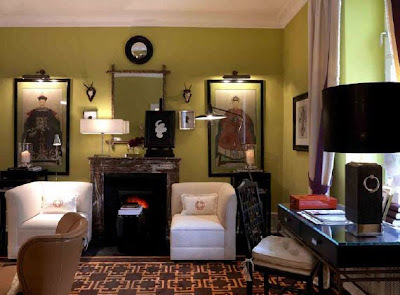 Bonan emphasizes this through his choice of colour and the interior design. According to the architect, an ideal synthesis has been composed of ‘Heidelberg’s historicism’, ‘Florentine elegance’ and ‘refreshing naturalness'”. 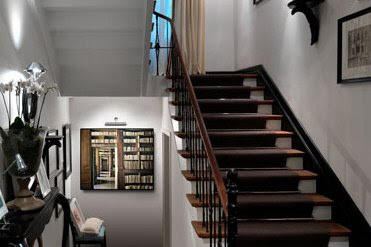 The Heidelberg Suites is purely Bonan’s vision. 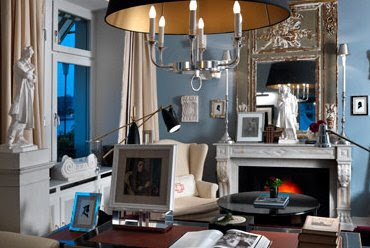 In addition to designing the architectural elements of the villas, he designed the interiors along with every single piece of furniture found in the hotel, which is available for purchase, if you are so inclined. 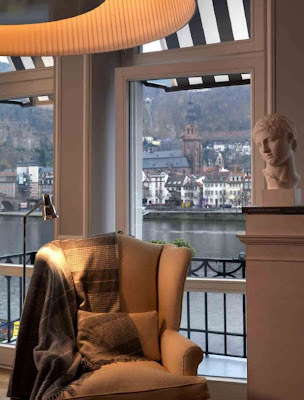 A sitting area in one of the suites overlooks the Neckar. Bonan’s Italian influence is very evident in this room. Notice the pattern in the rug. It is the same design he used for the hotel’s logo. Everything was custom made. The hotel features four types of suites ranging from a Standard Suite to the Penthouse Suite. Though they vary in size, every suite features a unique view of the castle and the “Old Town” along with two rooms, a fully stocked pantry kitchen with an espresso machine, and state of the art electronics. More importantly, they are dressed in Bonan’s signature style of mixing a bit of modernism with classical romanticism. The reception is the area of the Heidelberg Suites which reminds me most of Bonan’s JK Place Firenze and JK Place Capri. How romantic is this courtyard? I love the white buildings with the painted black shutters and black and white awnings. 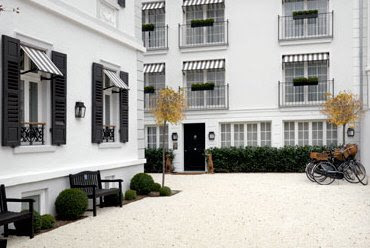 The little benches and vintage bicycles complete with wicker baskets add the perfect touch. A View of the “Old Bridge” and Castle from the Heidelberg Suites. I cannot adequately describe how much I love Michele Bonan’s work. He is the person I would turn to if I ever needed someone to design a dream villa or hotel for me. Notice I said “dream”! I can’t imagine he comes cheap. I adore his aesthetic and think his work is absolutely brilliant. As you may have noticed, there was no installment of my Jet Set series last week. 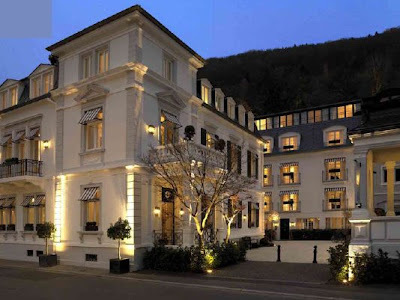 I hope that this week’s featured hotel, the gorgeous Heidelberg Suites was worth the wait! 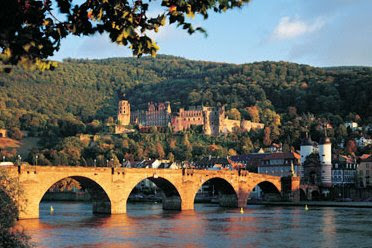 I don’t know about you, but I am definitely wishing I could book a little getaway to Heidelberg right now. Seriously, doesn’t it look romantic? I cant even pick a favorite! Definitely worth the wait! 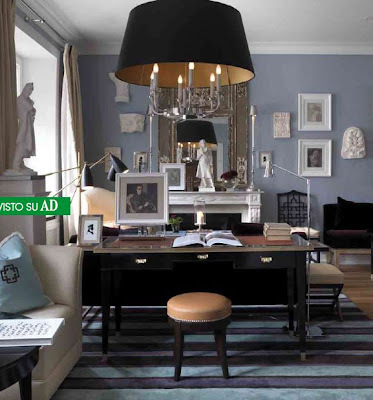 The suite at JK Place Firenze is exactly my style. Thanks, Kylie! It is right up my alley, as well. I think this man is a genius. I love everything he does. I just found your blog,, with the a post like this one, you leave me no choice but to follow you! What a fantastic and Inspring image gallery. Please pass me a bib i cant stop drooling! FAB FAB FAB! After he’s done with your house, could you send him over to do mine? I just found your blog and couldn’t tear myself away from reading and looking at your gorgeous photos! I would love to spend a week at each and every hotel! The decor is just gorgeous. It’s refined but not so sparsely decorated that the eye has nowhere to rest. Heidelberg is also a pretty town, dotted with pretty villas that wealthy Frankfurters visit for the weekend. 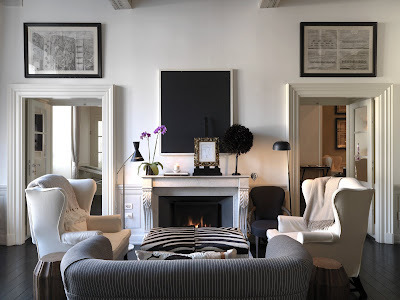 My husband and I celebrated or 10th anniversary this past October and had the pleasure of staying at JK Place in Florence. 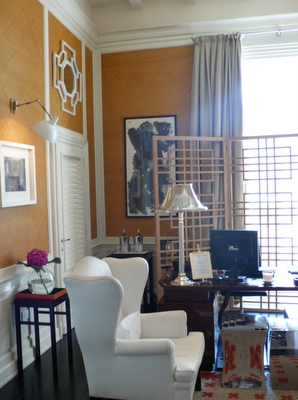 From the interiors to the staff, it was the most fabulous hotel we have ever stayed in. We can not rave about it enough!